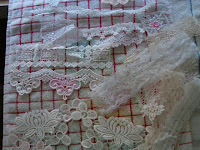 Mom and I were talking last week about the truck load (okay, maybe not quite that much) of lace I has mailed to my cyber friend Nicklee for dying. 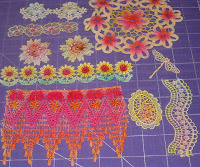 She is the Queen of Dyed Lace...and I begged her to do some of mine. Didn't really think I had a lot...until I started pulling from all my many drawers and boxes. But, in talking about permanent inks, I tolk Mom about a television program that Renee (another super cyber pal) had seen where they use aloe vera to float the ink. She said we should try and see if that would work with food coloring. So, hey, why not...it might cost me a few pieces of lace...but I 'apparently' have a lot! So we drug out our food coloring gels and the aloe-vera and water and paint brushes. We mixed our magic formula (a squirt of this, a dab of that) and started painting. We were so excited at the marvelous colors that we could do with this dye!! Wish now, I had been smart enough to take photos of the process...sorry. We painted and then we 'cooked' them in the microwave for a minute. Rinsed them again...and let them air dry. Gorgeous laces! When we finished...some hours later...I took the laces to the sink. Figured, I had best wash them off to ensure all of the residual food coloring was gone. And, yep, you probably guessed it...most of them came out white or cream again! We had a good laugh...and hours of fun doing them. Here's what did make it, and what didn't. 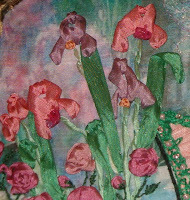 Well, since I've already admitted that I don't know how to do Crazy Quilt seams...but am trying...I will show you my crazy quilt art block, contributed to a dear cyber friend in a block swap. You will note that it does not have any finished seams...that's because I didn't know how to do them. 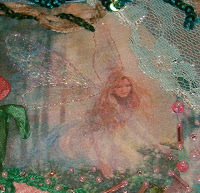 So glad that my friend gave me complete license to use my imagination and create this fairy wonder world. 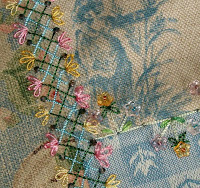 Very few embroidery stitches were used, and all are very basic...french knot, straight, daisy, and fishbone. I did simple spider-web roses and iris in silk ribbon (really, you don't get any easier than these). I was very happy with the composition and the theme carries well, I think. 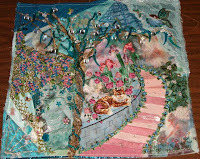 Especially for my very first full-size (12 inches) crazy quilt block. My friend seems happy to be the owner now...and that is all I was hoping for. Finally, I think I've got it! 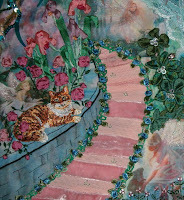 I have been wanting to do more crazy quilting, which wouldn't be difficult because I've done very little to date! Oh, I have several books...and have quilted for a while...just not much crazy quilting. Why? I'm horrible at stitching in a straight line! The more free-hand I have; the easier it is. Too messy? Just cover it up with another button, or charm, or piece of lace. 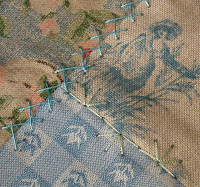 I have absolutely no fear with it comes to designing...it's the meticulious stitching that scares me to death. So, when a fellow stitcher on my HGTV Message Board recommended a set of "stitch guides"; I jumped on ordering them. Then, let them sit in my sewing room with little notice for a couple of months. I just pulled them out and used them to stitch the front of a needle case. Wow! I have found a tool that is really going to help me out!! How stupendous is that!